Current exhibit at the famed ShanghART gallery in Shanghai: a video and installation piece by 31 year old Xu Zhen who took a team to the top of Everest with ice saws and pulleys, sawed off a 1.86 meter (his own height) slice of the peak, and brought it home for display. Who cares how tall Everest really is, and why does it matter? There’s a running argument between the Chinese government and expeditions from other countries, about the “true” height of Everest–and who gets to decide what it is. The Chinese see it as 8848 meters, while a 1999 American GPS reading pegged it at 8850 meters. 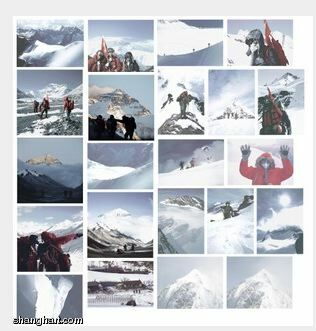 The PRC recently sent another team to re-measure the peak. You can find a translation of Xu Zhen’s narration of the event on ShanghART’s site. Note: ShanghART Gallery is a must-visit site with comprehensive photos and bios of the Shanghai artists they exhibit–all in English.